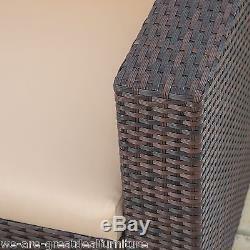 Westlake Outdoor Brown PE Wicker Loveseat & Ottoman Set. The Westlake Brown Sofa and Ottoman provide you with great outdoor seating and storage. 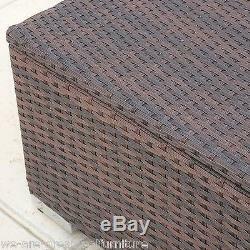 Constructed from all-weather wicker and a metal frame foundation, this set includes one loveseat and a storage ottoman. For added comfort, the chairs are lined with well-padded water resistant cushions. The set will look beautiful set poolside, on the patio, porch or garden area and users will get comfortable seating and a convenient place to store outdoor items. Set includes loveseat and a storage ottoman. Built with a metal frame foundation. 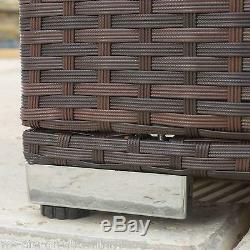 Constructed with durable and soft brown PE wicker. 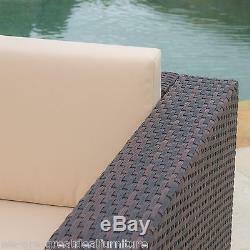 Water resistant beige fabric cushions. Ottoman can store various outdoor items. Neutral colors to match any outdoor decor. Assembly required (tools and instructions included). Throw pillows and accessories are NOT included. 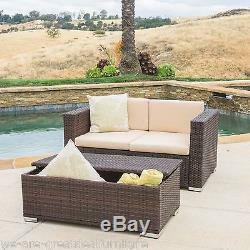 Loveseat: 32" D x 56.25" W x 25.50 H. Seat: 26.25" D x 46" W x 19 H. Table dimensions: 23.5" D x 42.75" W x 5.75 H. The item "Outdoor Patio Furniture 2pc Brown PE Wicker Loveseat Sofa & Ottoman Set" is in sale since Tuesday, June 09, 2015. This item is in the category "Home & Garden\Yard, Garden & Outdoor Living\Patio & Garden Furniture\Patio & Garden Furniture Sets". The seller is "gdfstudio" and is located in Multiple Locations. This item can be shipped to United States.